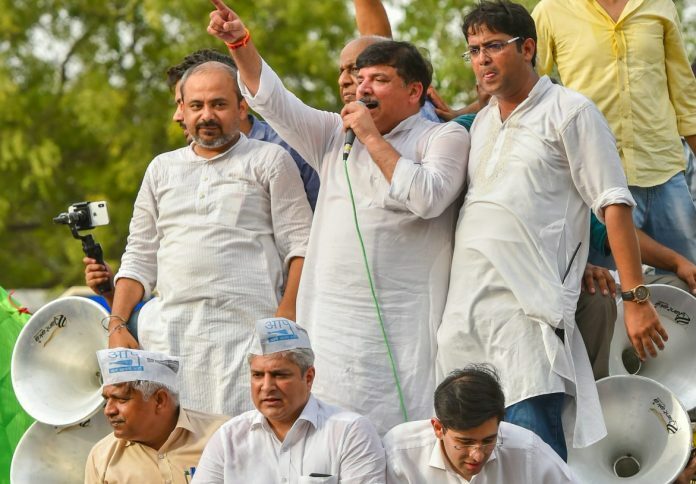 AAP leader Sanjay Singh said party would focus in Punjab, Haryana and AAP’s home turf Delhi to win maximum seats in 2019. The party will also field candidates for some Lok Sabha seats in Rajasthan, Madhya Pradesh and Chhattisgarh. In Bihar and Uttar Pradesh too, AAP plans to field candidates in some seats. In Uttar Pradesh, the party is looking to contest in 10 to 15 seats, Singh said. In Delhi, the AAP has announced in-charges for five of the seven Lok Sabha constituencies. They have already actively engaged with local cadre in organising meetings and campaigns there. The fate of two parliamentary constituencies – New Delhi and West Delhi – for which no one was named as in-charge amid rumours of a tie up with the Congress, is yet to be decided as AAP national convener Arvind Kejriwal, during his visit to Haryana recently, ruled out the party’s participation in any alliance. In Punjab, where the AAP managed to win four Lok Sabha seats in the last Lok Sabha elections and is the main opposition in the state Assembly, efforts will be made to enhance the influence of the party, Singh said. “We would like to increase our footprint in Punjab by winning more than four seats, this time,” the AAP leader said, adding the party may also contest in some seats in Gujarat where the organisation is strong. Haryana is another state where the AAP aspires to open its account in the 2019 Lok Sabha polls.